Delight your loved ones with this Embracing Pureness Flower Arrangement and make them realize how special they mean to you. 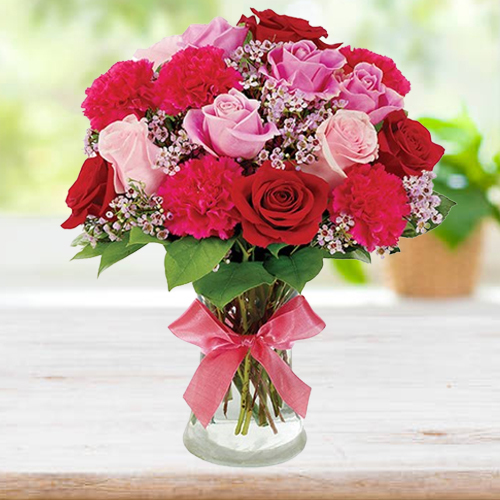 This bewitching Bouquet is the combination of Five Carnations, Seven Red and Pink Roses and filled with Filler Flowers tied with Ribbon and set in a Glass Vase. Flowers Delivery Amravati, Send sweets Ernakulam, Wedding Cake Bilaspur, Diwali Mithai Gorakhpur, Send Flowers and Gifts to Srikalhasti, Online Shop Jhunjhunu, Flower to Vijaywada, New Year Flowers Namakkal , Fresh Fruits Gandhidham, Send Gift Chandrapur, Dry Fruits to Kanchikacherla, Birthday Delivery Barasat, Sending to Jamshedpur, Flower shop Bhilai, Srikalhasti Online Cake Delivery.